Spring Cleaning Tip #1 Wash the windows- this will allow more light to shine through, and instantly lighten the rooms in your house. Spring Cleaning Tip #2 Open the windows on a warm day- air out the house one sunny afternoon to bring Spring’s freshness inside. Spring Cleaning Tip #4 Clean out the fridge- Make room for the bounty of fruits and vegetables. Make a quick check of expiration dates of food stored in refrigerator or pantry, and toss anything you just won’t use. Spring Cleaning Tip #5 Put away winter clothes and sheets, such as sweaters and flannels to create more space for spring/summer clothing. These are very simple tasks, and the point is to get you motivated for the upcoming season. After accomplishing just a couple of things and bringing in the freshness of outdoors, it will help you get moving in the right direction. Do you have a MUST DO Spring Cleaning Tip you would like to share in the comments below? Tip: Double-Duty Dustbin, get double results cleaning once! 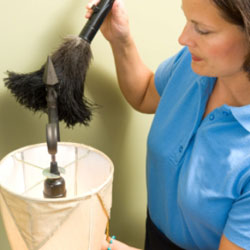 Use your bathroom garbage pail for mopping jobs. This way your garbage pail gets washed out every once in a while. Try this also with the kitchen garbage can as well if it is plastic. Ah…What an hour can do with a bit of strategy applied. Yesterday, I shared a cleaning tip strategy that I use at times when everything seems out of place in the house and there’s just too much to do and NOT enough TIME! As I put into action my 10 minute intervals strategy – here is what I managed to accomplish. 2. Cleared out tub sitting in the middle of the room & put the things on the shelf where they belong. 3. Vacuumed TV room and organized the furniture. 5. Boxes under desk in office moved into closet. 6. 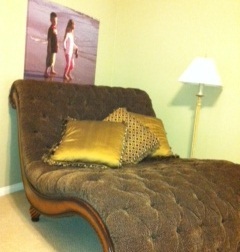 Wing Back chairs for sale, posted on Craigslist. 7. Wiped down kids bathroom. 8. Shredded documents sitting on the shredder. 9. 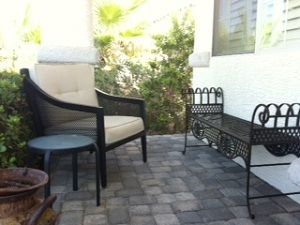 Rod iron bench out master bedroom and to the front porch. Now, I get that my list of things may seem rather sporadic. And guess what – they ARE!! But these projects & things to do have been looming over my head for a long while. It was bogging me down and I felt as if I just didn’t have time to accomplish them. But when I put my strategy of 1 hour, and only 1 hour, to work I broke out in a sweat and busted it all out!! I love the feeling of accomplishment. Today I have a new zest for the other things I need to do because of clearing hurdles out of my way. My purpose for sharing is to encourage you. When we have a sense of too many things on our plate, then our plans to save money and help our bottom line budget seems to get pushed to the wayside ~ it seems like too much work! That significant hour I spent yesterday will save me $$ in the future because I will plan my meals for the week around the current grocery sales because some big things are no longer looming. Did you try my cleaning tip? Think you will try it again? Or not? Have an hour? I am using mine wisely today. I feel like my house is a complete disaster and you may feel like yours is too. It’s Fall and just after the start of the school year and all that needs to be done can seem overwhelming and daunting. So the house might need more than an hour of work, but if you can set aside 1 hour you can get a great deal accomplished. Simply set a timer for 10 minutes and work until the timer goes off, and then move to the next project and work for another 10 minutes. Don’t get too hung up on making it perfect. Focus on one project at a time, instead of thinking about the long list of things you still need to do. Concentrate on working quickly and efficiently and do the best you can do in the time you have. Even if your house isn’t pristine after two hours of work, it will at least look quite a bit better than it did when you started. My hour to bust through the hosue starts at Noon today. Want to join me?